Astronomers have found the coldest (well, least hot) brown dwarf in deep space: by the name of CFBDS J005910.83-011401.3, it has a temperature of 350 Celsius (660 Fahrenheit). That’s still hotter than you need to bake cookies, but compared to a star it’s practically frigid. Now we should be careful with our semantics here. Planets have been detected around other stars which may be lower in temperature than this object, I suspect, but their temperatures have not been directly determined. In the case of CFBDSetc., the temperature was found by looking at its spectrum. The presence of ammonia in the atmosphere of this object was a dead giveaway that it’s cold; ammonia breaks apart when it gets too hot. Other features allow a temperature to be found, and 350 C is pretty cool. Other brown dwarfs are hotter, more like in the 1000 C range or so. The warmer an object, the brighter it glows, and the easier it is to find. So warmer ones are found first, and cooler ones are tougher. Brown dwarfs are weird. 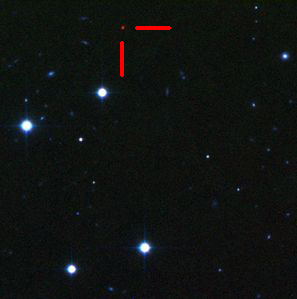 They’re objects with masses between that of a planet and a star, and the first were found just a few years ago. They are more massive than planets – CFSBD is 15 - 30 times the mass of Jupiter – but still far less massive than a star, and cannot continuously fuse hydrogen to helium in their cores. The ones we find tend to be young and still hot from their formation. Eventually they cool off, since they cannot generate heat in their cores as stars do. Obviously, CFSBD has been around the block a few times to have had enough time to cool down so much. That alone makes it interesting. But since it’s so cool, its atmosphere is more like a planet than a star. Getting direct observations of a planet around another star is incredibly difficult, so studying this weird object will no doubt generate insight into planetary atmospheres with temperatures intermediate between what we see here in our solar system and brown dwarfs we detect out in space. And now that we’ve found one, I’ll just bet more will pop up in the next few years. Once we have enough to get statistics on them, our knowledge will increase rapidly, just as it did when brown dwarfs were discovered in the first place. Funny– as I write this, it’s snowing outside. Cold is relative, I suppose, but one thing I like about new discoveries is how they stretch our minds just a little bit, and make us re-evaluate what we mean by things like “hot” and “cold”. I’ll still put on a coat and gloves when I go outside in a few minutes, but in my mind I’ll wonder what it’s like to walk across Mars, where it’s so much colder, or Mercury, where it’s a tad bit warmer. And what would it look like to hover over a brown dwarf, orbiting an object that’s the physical size of Jupiter, but is neither a planet nor a star? What odd weather patterns would paint the view? The Universe is weird. I’m glad we get the chance to take a look around.